Why would you want this? 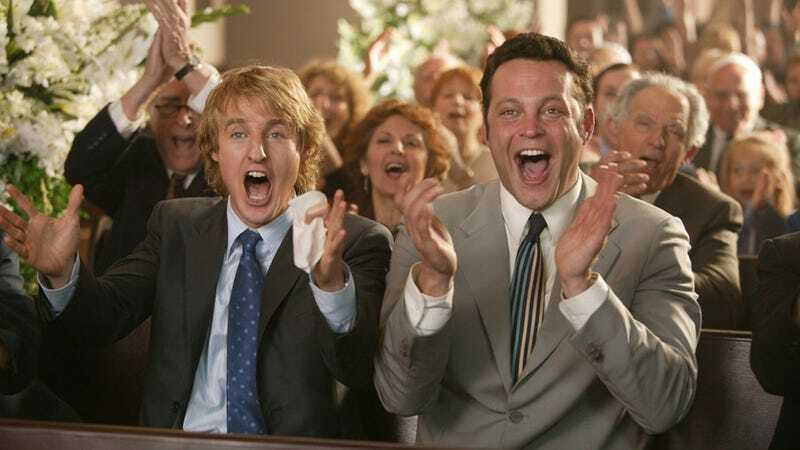 Why would you want a ten-year-old Vince Vaughn movie to be a part of your big day? Also, did anyone mention to you that “crashers” are not actually crashing anything if they are openly invited? Yes, I know, “offbeat” and “unique” weddings are all the rage right now (enough so that even hotels are getting in on the action with packages full of surfboards and hashtags), but you know what’s not unique? Anything involving a major feature film so popular that it grossed almost $300 million worldwide. Anyhow: The couple will be wed in a private ceremony to be followed by the reception at a local shopping center, which is open to the public. They’re prepared to host 1,600 “crashers,” but that estimate seems cluelessly optimistic seeing as there’s no open bar. So what we’re really talking about is not a Wedding Crashers theme so much as an Everyone Please Come to the Mall for No Other Reason Than to Look at Us, Please Pay Attention to Us theme.